Very fruity start on the nose with green apples, pears, banana, passion fruit and subtle coconut. Ester-like and fresh with a soft touch of floral notes and a hint of malted barley in the back. It's young, but already very pleasant. Similar flavours as on the nose. Fruity at first with green apples, almost cider, mixed with pears and passion fruit. This is followed by a surprisingly pleasant spiciness of oak, white pepper and nutmeg. Nicely warming towards the finish. The finish shows good length with a warming peppery note, mixed with creamy toffee, vanilla and a fruity touch of pears on the tail. Very nice. Very fresh and fruity on the nose when a few drops of water are added: pears, banana and some more floral notes in the back. Fresh and vibrant. On the palate, the fruitiness is a bit tamed with pears and passion fruit. Creamy vanilla's shining through with toffee and a warming spicy edge of pepper towards the finish. The finish is a bit shorter, creamy sweet with vanilla and a nice touch of pears on the tail. The peppery note is almost gone. A nice surprise! 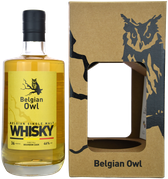 This is a pleasantly fruity and creamy sweet Belgian single malt with lots of yellow fruits and a delicate spiciness coming from the wood. No doubt, it is a young whisky, where richness, depth and complexity are rudimentarily present. But the spirit is very good, and I am quite curious how this malt will taste with a few more years of maturation.